This work is the transformation of a chapter my doctor of creative arts, UTS, BLACK BOX http:www.strangecities.net for peer review in a forthcoming eJournal interactive paper – the ensemble of image, sound, and textual research emerges from the ChineseBOX passage in BLACK BOX, exploring my hybrid cultural origins through discovery of the Russian jazz music culture from pre-revolutionary Shanghai and the Japanese occupation in China. This is a portrait of my grandmother Xenia Vladimirovna Ermolaeff. Xenia was a Russian emigre in Shanghai (a singer and dancer). The portrait was taken by her husband my grandfather a Russian jazz orchestra leader Sergei (Serge) Ermolaeff circ. 1940. 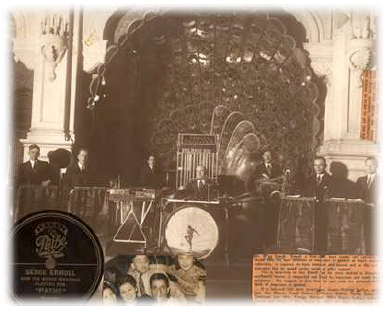 Serge Ermoll & His Music Masters were managed by Vaudeville Entertainments, Shanghai and enjoyed residencies at establishments in Shanghai such as The Cathay Hotel, The Paramount, Ladlows Casanova, Wagon Lits, Astor House, and the Red Rouge. He played with Whitey Smith. In my grandmother Xenia and the portraits she would show me, I saw a cosmopolitan Eastern woman of urban sophistication, paradoxically at odds with the Australian life we were surrounded by in the Sydney suburbs. Her black coiffured hair and gold jewellery provided endless fascination, she looked so different from the ladies at the local RSL. I wanted to be like her. (2) Whitey Smith and .L. McDermott, I Didn’t Make a Million, Manila, 1956. Image source. 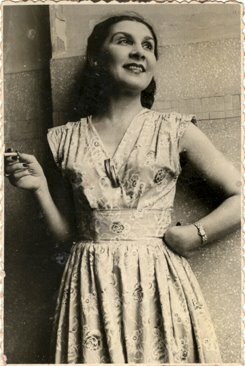 Photograph of Xenia Vladimirovna Ermolaeff n a Shanghai hotel by Serge Ermoll (Ermoll’s photos) circa 1940 (Shanghai). Anyi’s Literary Production in the 1990s”, in Positions: East Asia Cultures Critique, pp. 348-387. Duke University Press. This is a portrait of Asja Mercoolova as a girl, my grandmother Xenia’s goddaughter. Xenia wanted me to be a dancer like Asja. She wanted me to be on the stage. She would ask me to sing and perform songs for her in the old fashioned lounge-room with the radio on in the background. 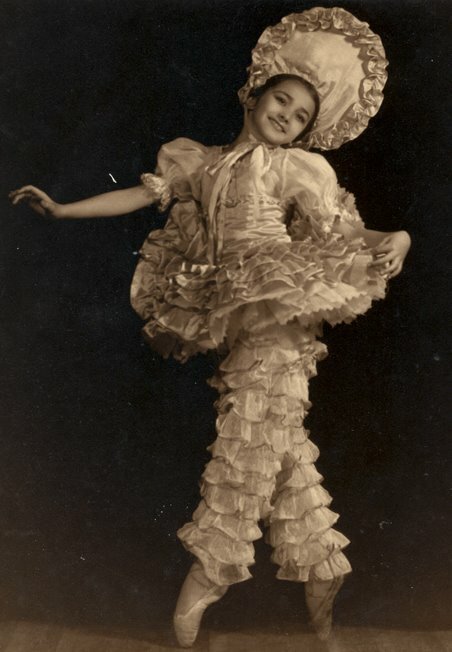 They sent me to dance classes – modern, jazz, tap and later I studies Flamenco. I still wear Flamenco shoes every day to work (!) I grew up listening to my grandfather Sergei’s jazz. He would practise in his music room on the trumpet, at the piano and at his vibes. One day in the future I would be packing away his musical scores, piled high on top of his piano, and he would be gone and buried. River Lights club in Sans Souci is a vivid memory, staying up too late, and watching him play. He wore exquisite tailored suits and painted on his eye-brows, cabaret style. 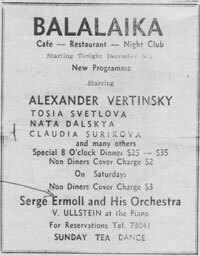 The music was a melange of Russian folk ballads, American jazz, and Chinese pop. The compositions were for a famous crooner he remembered, Alexander Vertinsky, writer of the legendary tune “Immortal Road”, that world sings today as “Those Were The Days My Friend!”. Before my grandmother (Xenia Ermolaeff) died, she gave me a set of hand painted studio portraits she had produced while living in Shanghai (1923-1951). Wrapped in tissue, when she was feeling sentimental, she would produce these from the musty old wardrobe that was filled with beautiful dresses and shoes. When she went out to the club for lunch, I would try these on and pretend I was her, standing in front of the large oval mirror. In the noirish light through the blinds in her bedroom, wearing her oversized patent-leather shoes, I painted on her lipstick. These portraits conjure the decadent life of a a beautiful young Russian woman living in Shanghai at its zenith. The mystery in those eyes reveals suffering a life of extremes. In Sydney, in the Holden, we would sit waiting for Serge, as she sipped sherry from a silver hip flask, telling me about her feelings. As a young girl in Russia, she was the daughter of a wealthy Tsarist naval officer, but was reduced to stateless person seeking refuge in Harbin, Manchuria after the Bolshevik Revolution in Russia (1917). Later she married my grandfather Sergei, a wealthy Russian big band leader in Shanghai (husband No#2). The Shanghai sojourn was a wild ride, until she was made refugee once more with the Chinese Revolution. Her life ended in the Sydney suburbs with a three acre block and hills hoist – and a moonshine plum orchard. I was a great joy in her later life – the daughter she longed for. When she pointed to photographs of her god- daughter Asja the ballerina, she told me that she had married a Broadway musical director, and would I be a dancer like her? Film star & songstress Li Xianglan a hybrid matrix of Japanese and Chinese modern girl. The Parisian wave (coiffure) and the fur coat over the shoulder evoke the Shanghai gesture, a powerful imaging (and re-imagining) of the Shanghai advertising lady, her urban face charmed the packaging of a plethora of mass products from face powders to cigarettes. 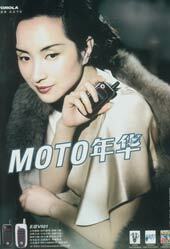 She is the face of Motorola’s 2004 mobile phone campaign. Reminiscent of a 1930s Shanghai calendar girl, an evocation of the legendary film star Ruan Lingyu (阮玲玉), or perhaps Hollywood’s The Lady From Shanghai (dir. Orson Welles), or Anna May Wong in Josef Von Sternberg’s Shanghai Express (1932) http://www.theauteurs.com/films/432, or Street Angel (馬路天使) (1937) http://www.archive.org/details/street_angel starring Shanghai songstress Zhou Xuan (the “golden voice”) and pre-revolutionary film star. Perhaps Motorola’s Shanghai lady resembles the famous Li Xianglan (李香蘭) a hybrid matrix of Japanese and Chinese modern (modeng) girl (!) 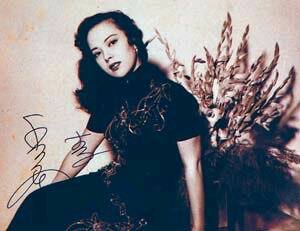 She was born Yamaguchi Yoshiko (山口 淑子) to Japanese parents in Manchuria, and became a famous Chinese and Japanese film star. She is remembered for 1940s film Shanghai Nights (上海の夜), made by Manchuria Film Productions and singer of the immortal tune The Evening Primrose (夜來香). Nostalgia for decadent old Shanghai and its hybrid brand of quasi-colonial East meets West is articulated in the the plethora of contemporary Hollywood , Hong Kong and Chinese films devoted to the Shanghai Gesture. Academy Award winning director Ang Lee’s latest offering Lust Caution (2007), a case in point, Merchant Ivory’s The White Countess (2005) http://www.sonypictures.com/classics/whitecountess/, to touch the tip of the iceberg. 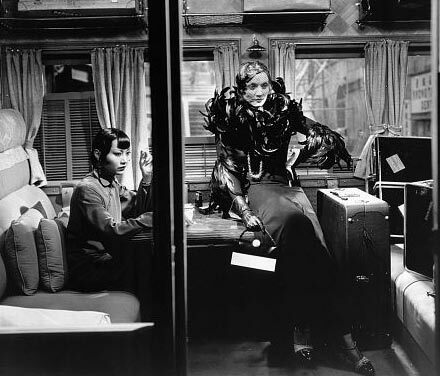 On this note, the multi-national MECCA cosmetics corporation http://www.meccacosmetica.com.au/ has recently launched its “Shanghai Lil” make-up range, a homage to the high fashion (haute couture) and make-up used in Von Sternberg’s Shanghai Express. 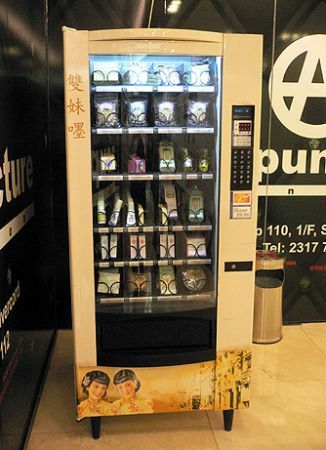 Selling cosmetics by vending machine? “In Japan you can find all sorts of things for sale in vending machines. Since I’ve lived in Hong Kong however, I’ve never seen an explosion of this sort of retailing in the city. So it came as a surprise to encounter a lonely looking vending machine while walking through Silvercord shopping center last week. “The vending machine had a traditional 1920’s era graphic of two girls covering the outside. “The location of the machine was also somewhat off. It was buried near the side of an escalator in an alternative entrance to the shopping center.